Several days ago, we (lifepatch) organized a workshop on Water Sample Gathering Method for the preparation of Jogja River Project (JRP) in 2013. 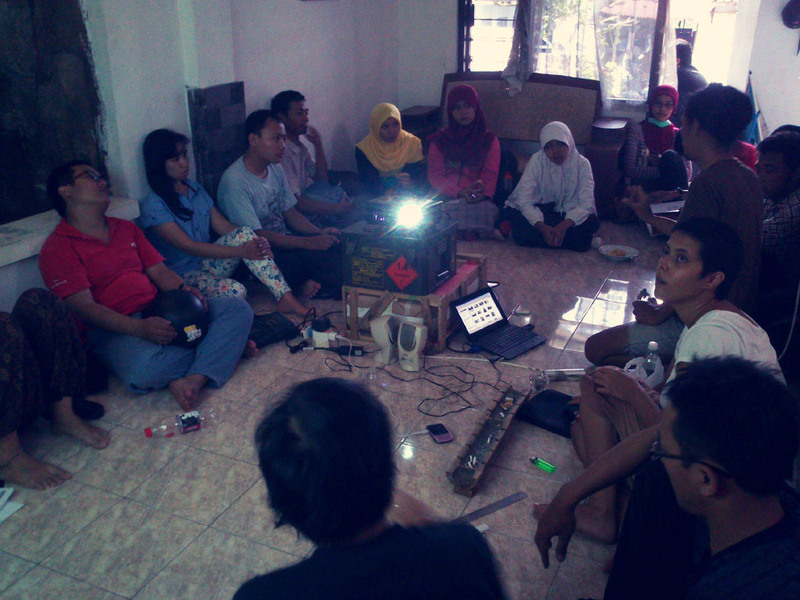 These workshop is the first activity from us for JRP 2013. The workshop was intended to learn together on appropriate method for river water sampling according to SNI (Indonesian National Standard) operation. Although the workshop was open for public, we invited the core team member that will do the sample gathering on the rivers. The workshop was started by learning step by step procedure from SNI on water sample gathering and analyzing. The main highlights is the field operations such as the points of river body where the sample must be taken, the depth, quantity of samples etc. We wanted to as efficient as we can on the field and avoid unnecessary error which could lead invalid data. But the most important thing from us is that we want to learn how to do it together. This workshop not only give as the first step for us to understand the necessary basics in water quality analization but also to gather interested participants and team members. This workshop is a step of coordination also preparation for all of us before we do the expedition on the three rivers of Yogyakarta. We went to the little canals outside of lifepatch house to do a simulation on water sample gathering. Timbil Budiarto took the initiatives to jump on the center of the canals to show the proper water sample gathering. It looks quite simple, but we understand that on the river, it won’t be as shallow and most probably with bigger currents. We conclude the workshop with several discussion on our plan for JRP 2013, arranging dates, listing equipment we will need. Further step, we will still have to coordinate with Mr. Donny Widianto, our head collaborator from Microbiology Agriculture Faculty of UGM Yogyakarta. We’ll take it step by step and enjoying it, but to be honest, I can’t wait until we go out to the rivers.